Lucía lives with her eight-year-old sister, Maciel, and her mom, Nilda, in El Alto, a satellite city of the Bolivian capital of La Paz. Her father, José, drives one of La Paz’s minibuses known as a “trufi.” Although he doesn’t live with them, José cares deeply for his daughter and contributes about $240 dollars a month to cover Nilda’s household expenses, including the $90 monthly rent as well as food and bus fare. Nilda’s parents live close by and help her care for her girls, but are unable to help them financially. When Nilda detected that her second daughter was not thriving like her sister had as an infant, she took her to the city’s children’s hospital where they first diagnosed her heart defect. It was a terrifying moment for Nilda: When I took my girl to the hospital and they told me how much the surgery would cost, I didn’t know what to do. From La Paz she was referred to the far-off city of Santa Cruz to be included in a surgical campaign at the Incor Clinic precisely for children with Lucía’s condition. 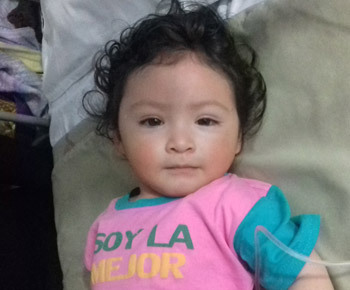 Nilda’s expressed her feelings upon arrival at the Incor: Thanks to the orientation provided by the doctors at the Children’s Hospital, I am here now. I am very happy and grateful for your help. It is a dream-come-true that my little daughter is going to undergo the procedure. After her cardiac catheterization procedure, Nilda and Lucía stayed for a few days with a distant aunt, their only relative in Santa Cruz, before returning home to El Alto, where Lucía is making a strong recovery.